Twenty (20) of the major occupational categories lag the median wages in Silicon Valley. Ten (10) lag by less than 10%, ranging from -0.4% to -7.8%. Ten (10) categories lag by over 10%, ranging from ‑11.7% to -74.8%. This analysis, like the two prior wage comparisons for Santa Cruz County, is based on data from the May 2013 National, State, Metropolitan, and Nonmetropolitan Area Occupational Employment and Wage estimates from the U.S. Bureau of Labor Statistics. In this analysis Monterey is used interchangeably with Monterey County. Silicon Valley is used interchangeably with Santa Clara County. Also, the term “wages” is used interchangeably with “base pay and base salaries”. A cautionary note: Reviewers should keep in mind that these are statistical “estimates” of wages that are based on data reported by employers in the counties involved. The data points are estimates; however, they are based upon quite possibly the most comprehensive wage database in existence, and provide a valid basis for attaining a general assessment of an area’s competitive landscape. This data should be treated as only one of several inputs in assessing the pay competitiveness of a specific enterprise. Chart 2 is included to graphically illustrate the median annual salaries for the major occupational categories (listed in the same order, from least to most competitive, as those shown in Chart 1). The (+/- %) differences in Chart 1 correlate to the variations in height between the blue and red bars for each occupational category depicted in the chart. 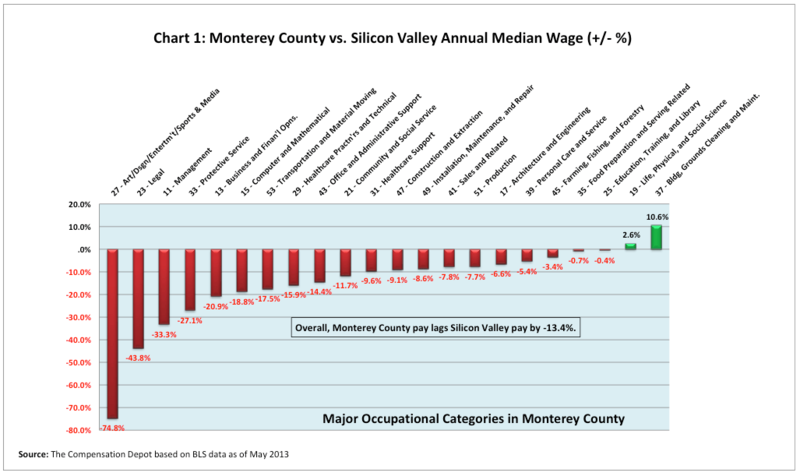 Refer to Charts 1 & 2: Monterey median wages lag Silicon Valley in 20 of the 22 major (high level) occupational categories with 10 categories lagging by more than 10% and 10 categories lagging by less than 10%. Only 2 occupational classifications pay more than Silicon Valley (+2.6% & +10.6%). (Caution: These categories are very broad, containing jobs with a wide range of pay competitiveness. For example, the Management category (for Monterey County) includes 21 job titles with competitiveness ranging from 60 Education Administrators, All Others (+23.3%) to 290 Sales Managers (-83.6%). This study focuses only on the major occupational categories and their 300 underlying jobs in Monterey County – jobs that also exist in Santa Clara County. Monterey County employers reported employees in a total of 384 job classifications to the Bureau of Labor Statistics (BLS), whereas Santa Clara County reported employees in a total of 497 job classifications. 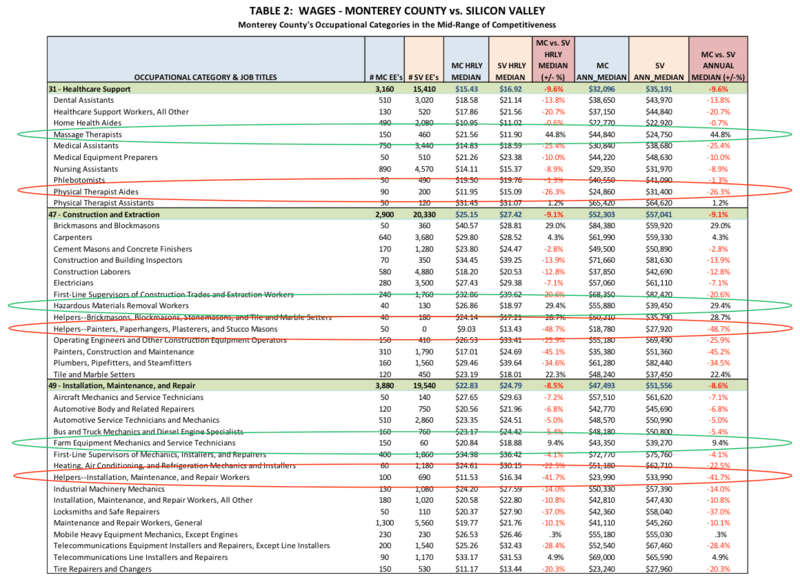 Only two (2) of Monterey County’s 384 job classifications were not reported to BLS by employers in Silicon Valley (which includes Santa Clara & San Benito Counties) indicating a huge diversity of jobs, a diversity with large sample sizes that adds validity to this analysis. Table 1 focuses on the three overall “less competitive” categories. The top category, Management (-33.3% overall, with 11 underlying jobs) ranging in competitiveness from +23.3% (Education Administrators, All Other, green oval) to -83.6% (Sales Managers, red oval). The third category, Art/Design/Entertainment/Sports & Media (-74.8% overall, with 10 job classifications) has a competitive range of from +18.9% (Audio & Video Equipment Technicians, green oval) to -193.4% (Interpreters & Translators, red oval). Table 2 is provided to focus on three occupational categories positioned “mid-range” in the Chart 1 competitive distribution. The top category, Healthcare Support (overall -9.6%), includes 10 job titles ranging in competitiveness from Massage Therapists (+44.8%, green oval) to Physical Therapist Aides (-26.3%, red oval). The second category, Construction and Extraction (overall -9.1%) includes 14 jobs ranging from Hazardous Materials Removal Workers (+29.4%, green oval) to Helpers-Painters, Paperhangers, Plasterers and Stucco Masons (‑48.7%, red oval). The last category, Installation, Maintenance & Repair (overall -8.6%) includes 16 underlying job classifications ranging in competitiveness from Farm Equipment Mechanics and Service Technicians (+9.4%, green oval) to Helpers-Installation, Maintenance and Repair Workers (-41.7%, red oval). 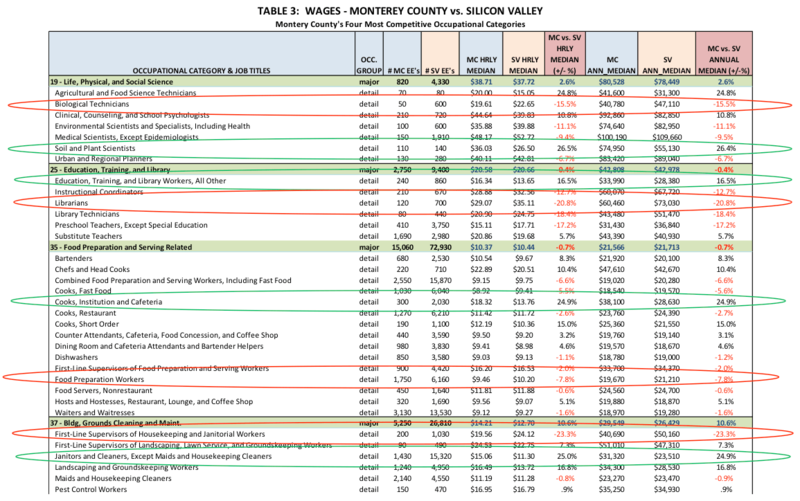 Table 3 provides detail on four of the six occupational categories where overall Monterey County wages are most competitive with those of Silicon Valley. The first occupational category is Life, Physical and Social Science which leads by +2.6% overall. It includes 7 job classifications ranging in competitiveness from +26.4 for Soil and Plant Scientists (green oval), to -15.5% for Biological Technicians (red oval). The second occupational category is Education, Training and Library which lags by +0.4%% overall. It includes 6 job classifications ranging in competitiveness from +16.5% for Education, Training and Library Workers, All Other (green oval), to -20.8% for Librarians (red oval). The third occupational category is Food Preparation and Serving Related which lags by +0.7% overall. It includes 15 job classifications, 7 of which have higher wages than Silicon Valley. These jobs range in competitiveness from +24.9% for Cooks, Institution and Cafeteria (green oval), to -7.8% for Food Preparation Workers (red oval). The fourth occupational category is Building, Grounds Cleaning and Maintenance which leads by +10.6% overall. It includes 6 job classifications, 4 of which have higher wages than Silicon Valley. These jobs range in competitiveness from +24.9% for Janitors and Cleaners, Except Maids and Housekeeping Cleaners (green oval), to -23.3% for First-Line Supervisors of Housekeeping and Janitorial Workers (red oval). It is much like a Geico commercial to say that Monterey County is one of the most beautiful places on earth. Everyone knows that! The tourist, with camera in hand, capturing the beauty of its landscapes is a very familiar sight. These snapshots capture the scene as it exists at the time the shutter is released, yet, even natural landscapes change over time. 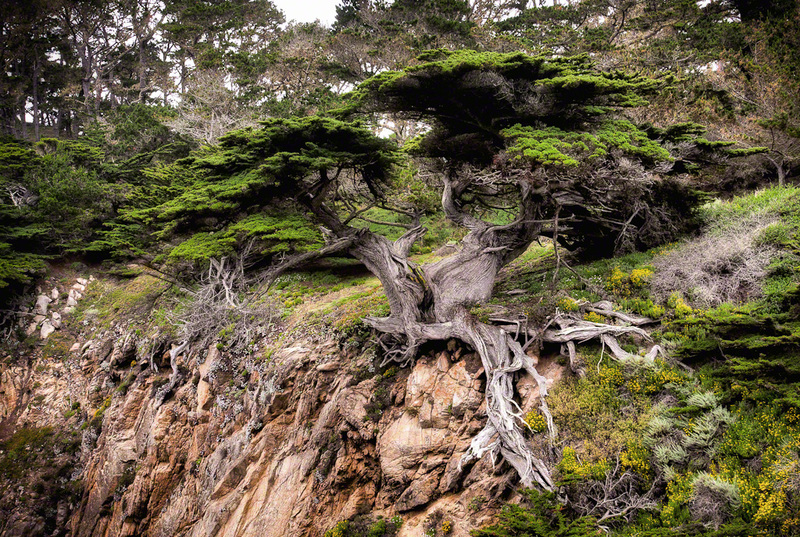 One can only imagine how this image of “The Old Veteran” at Point Lobos has changed over the last 1,000 years. 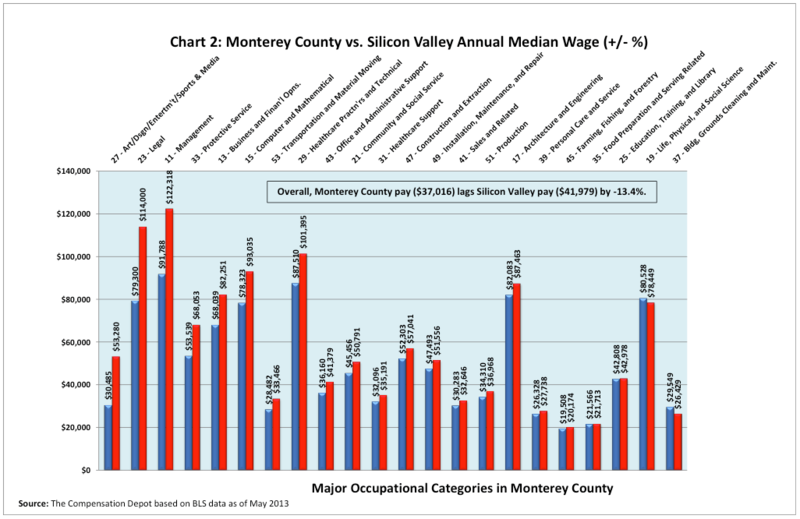 This analysis provides a “snapshot” of Monterey’s wage landscape as it existed in May of 2013. This landscape, also changes over time… like the Monterey Cypress, it is shaped and re-shaped/pruned by the winds of economic change. So, What Can We Do With This Snapshot? We have a choice. We can place it in the archives, filed away in a dark room to collect dust. Or, we can take an active role in the “shaping and pruning” process. My hope is that we choose the latter. We do this by influencing the “winds of economic” change as best we can, even if it’s observing a snapshot and asking WHY wage extremes exist. Is there a justifiable reason why some employees are paid twice what others doing the same job are paid? Maybe it’s because they are twice as productive and we may decide that’s okay. But, maybe it’s because they’ve continued to receive a hefty wage increase every year for many years with no corresponding increase in results. A fruit tree that receives too much water is apt to grow branches that are too long and too heavy (and produce less fruit). The wise caretaker will divert the water supply to other trees that are receiving too little water. The wise manager will recognize that this same phenomenon probably exists in his/her organization. Maybe it’s time to take a closer look at the snapshot and do a more focused wage study on your organization and, if appropriate, consider some interventions in the water/wage flow process. Successful organizations have a pay philosophy that is owned by executive leadership and clearly articulates WHAT the organization intends to pay for. Based on the pay philosophy, managers know WHAT behaviors to reward and employees see the link between their pay and the results they deliver. How do we pay to attract, retain and motivate the talent we need to achieve the organization’s goals and objectives? Successful organizations have a stellar pay strategy. The pay strategy supports the pay philosophy. It clearly defines what “competitive” means by naming the specific organizations with which it competes, and states the level at which it intends to compete (e.g., median, 60th percentile, etc.). An effective pay strategy is owned by executive management and empowers the management team at all levels . . . ensuring it has the ability to attract, retain and motivate employees to meet the organization’s goals and objectives. Successful organizations provide the management team and their employees with the tools they need to effectively manage and understand the pay programs, systems and administrative processes. These tools include, but aren’t limited to: program communications, supporting documentation, administrative procedures and effective training, geared to the differing needs of management and employees. Enough said. What do you think? 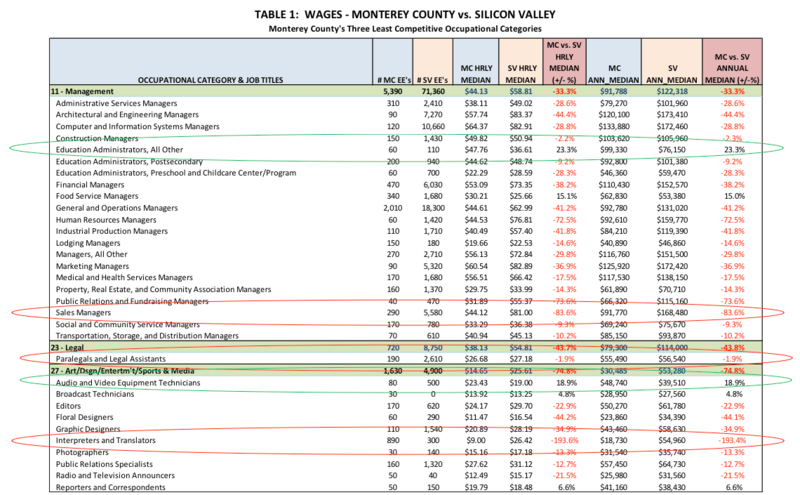 How do Santa Cruz wages really compare to Silicon Valley?